The BIPAP and the CPAP are similar machines with some key differences. They are both non-invasive ventilation systems meant to keep the airway open and deliver oxygen, particularly at night. One question we hear frequently is "what is the difference between a BIPAP and a CPAP, and can they be used interchangeably?" To understand the answer to this question, you need to understand the difference between both machines and their respective functions. A CPAP (continuous positive airway pressure) machine is designed to deliver a continuous flow of air at a set pressure to keep the airway open and the tongue pushed forward. According to the American Sleep Association, "Continuous Positive Airway Pressure is the most popular and effective treatment for obstructive sleep apnea. BIPAP (BiLevel positive airway pressure) machine is similar to the CPAP machine in function, but with some very important differences. A BIPAP machine uses alternates between a lower and a higher level of pressure depending on whether the user is inhaling or exhaling, thus making it a better tool for people who have difficulty exhaling against the pressure of a CPAP machine. As mentioned before, it is usually more difficult for a patient to exhale against the constant flow of a CPAP. Most people can adjust to this difficulty and don't even notice it after they've been using the machine for a few weeks. Not everyone is able to adjust, however. 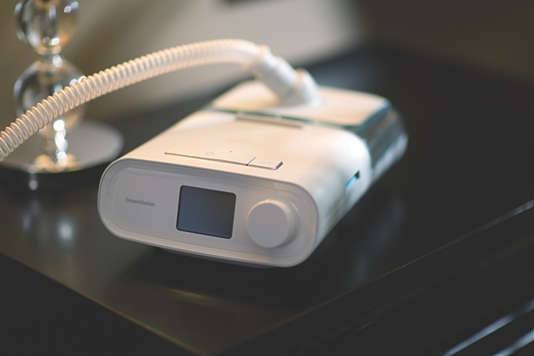 Since it was first designed, several attachments to the the CPAP have become available to alleviate difficulty exhaling. For example, the C-Flex can adjust the pressure during the breath cycle to make exhalation easier. There is also an attachment that starts the pressure below therapeutic value until the patient goes to sleep, which for some is more comfortable. These attachments can make the more expensive BIPAP unnecessary in some cases. A CPAP is generally not appropriate for any condition where the breathing is very weak, or the oxygen saturation is very low, such as COPD. • Inappropriate for people whose breathing is weak or O2 is low. BIPAPs have a more diverse range of use than a CPAP. The pressure flexes with the patient's breath cycle, making it easier to exhale. The BIPAP is better for conditions that require high pressure therapy or conditions where a persons breathing tends to be weaker. So why don't we use a BIPAP for all conditions? It isn't usually necessary where a lower pressure setting is needed and it's generally a lot more expensive. What are the side effects? For both therapies they're are usually nothing more than irritation caused by dry air flow. Most of these side effects can be negated by a humidifier attachment. The NIH does warn, however, that you should stop using the machine if you feel bloating or stomach discomfort and notify your doctor immediately. This is because gas and bloating in during this therapy is caused by air being misdirected and flowing into the stomach and intestines. This usually isn't serious, but it can be extremely uncomfortable. Doctors will attempt to correct the problem by adjusting the type of mask used and adjusting the pressure. However, if the problem cannot be corrected, they may perform further tests to determine if there is an underlying physical cause. How Do We Know Which to Use? Doctors will determine whether the BIPAP or CPAP machine is more appropriate for you based on a patient's diagnosis first. They also base their decision on the pressure settings needed, and determine how much pressure is needed based on an algorithm. After this, it's mainly trial and error; if someone cannot adjust to one machine, they may try switching to another. It's important that adequate testing is used to determine a patients needs. If you require either of these therapies, keep an active line of communication between yourself and your health care provider and don't be afraid to say something if your therapy is making you uncomfortable. Wedge pillows also help with relieving breathing obstructions to give better sleep.